The holidays are here and so are still my back pain and migraines. While I do my best to manage the pain at home, it still follows me into the field. I now take with me a little foot stool to put one foot up on, which seems to help but once done and back in the car, the evil one reappears and by the time I am home it is all I can do to scramble into bed and lay prone, propped and medicated. Until we paint again. Spine be-damned, I am going to paint through the holidays! And so today we went to Ross Bay Cemetery. One of us wasn`t feeling the location and took off for a walk while the other stuck around to get a start on this sketch. I finished it in the studio this afternoon after said pain nap. I am very happy with the unfinished look of this piece. I love working on raw wood because it grabs the paint from my brush and seeing it peering through the paint is lovely. Keeping one big area that loose helps me stay relaxed with rest of the painting. I attempted to include a couple headstones but they looked `stuck on`. Ah well, another day, another skill to develop. I managed to combine extra long days and vacation hours to take every Monday off of work this fall. Breathing space. Painting time. My time. This past Monday I wasn’t up for venturing out alone unto plein air so I tackled a studio painting. 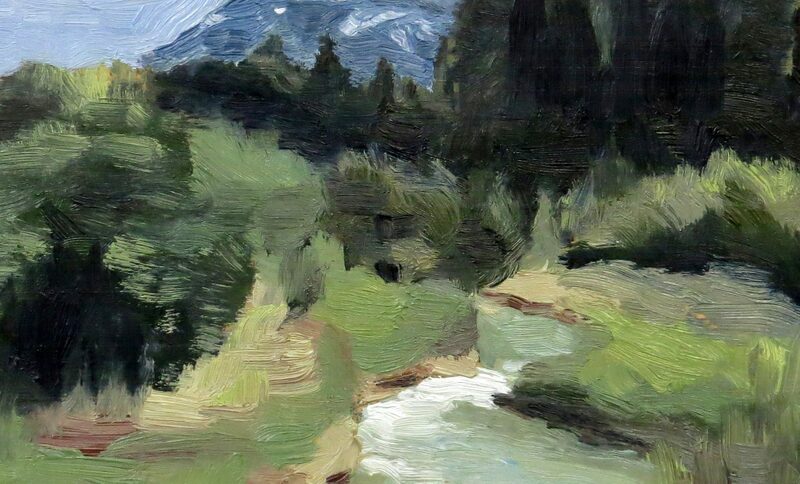 I had soured on studio painting a bit ago when my plein air work started to show progress. 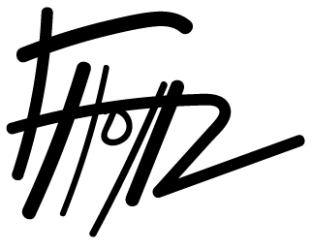 I was afraid to go back into the studio for fear of failure. Fear; the great instigator. When Andrew and I visited Jasper the summer before last, one of our most memorable hikes was full circle around Valley of the Five Lakes. That experience included a close encounter with a bear (but not too close), lots of cheesy singing to ward off said bears and many stunning views. I captured a few of those scenes on the digital film and so this past Monday was born a little valley stream scene. There is a destination I’m chasing and that is to paint loose yet accurate. To paint in my own style while following the thick footprints of plein air painting tradition and a very healthy and vibrant contemporary community of practice. How to be myself within all that history and activity? One of my constant questions. The lovely Facebook (sarcasm) fed me a quote which helps to calm that questioning voice. And so I did. And I felt the paint naturally flowing, the colours matching and the style evolving. And this is why I treasure my Mondays… and ruminate on how to maintain them in 2015. 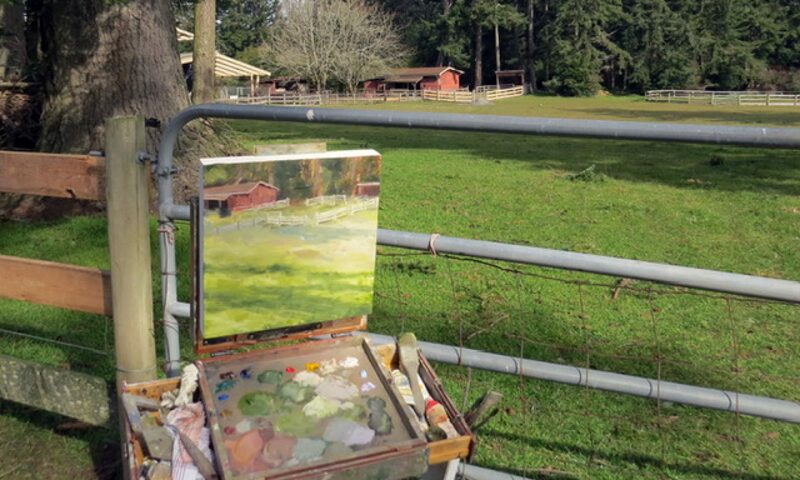 Aylard farm in East Sooke was the latest lovely spot in our weekend painting adventures. The weather was mixed as we made our way out there with rain and clouds making way for a few patches of light blue. 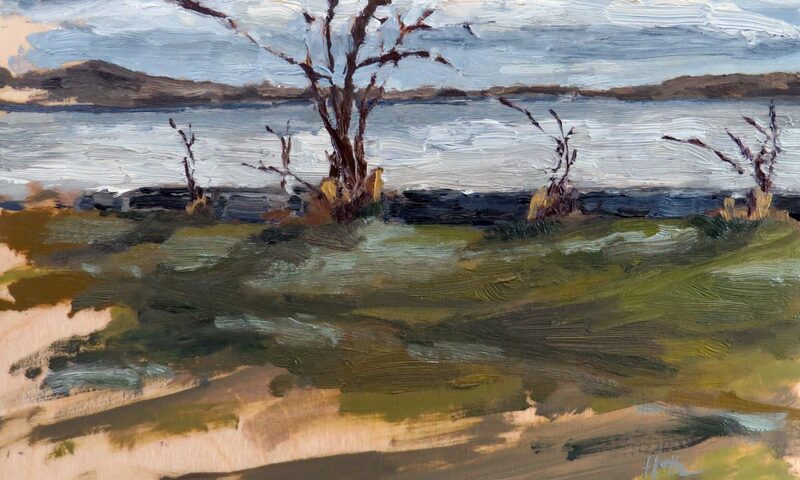 Once set up, the sky began to clear more so I ventured out from under the covered picnic area to paint by the edge of the ocean. Painting outside has made such a difference in our lives. We used to go walking and hiking to many of these locations but just being there, in the spot, for a goodly amount of time, allows me space to just watch and listen. Like when you decide to stop formulating a response in a conversation and just listen… I am just listening to the world when I paint. Outside. This painting came off the brush very quickly. It felt new and challenging but also familiar. I know those blues. I understand those mountains. Those clouds are crazy! And there they go. And here come others. The dialogue in my mind as I paint is one to treasure and learn from. In this painting I felt acceptance – of why I was there, of the marks I was making and of the result. It just was. Right.